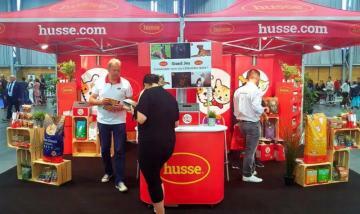 On the 3rd and 4th of June Husse attended the French Championship of Pedigree Dogs in Nantes. This is annual event and around 8,000 dogs and their owners are attending. Event attracts every year many dog lovers and people connected with pet food industry from whole Europe. Many owners like taking their dogs on walks to enjoy the warm summer weather, but they may forget one important detail: hot pavement might burn a dog's paws. Tass Plus can easily be spread on dog's paw pads prior to walking to protect them from rough or hot surfaces. Husse is official sponsor of National DiscDog Association in Japan, they are organizers of the biggest events in the country when it comes to pets. Lately Husse sponsored National Disc Dog Championships, more pictures you can see here.